John was invited to give a presentation on search engine optimization to small business owners at the WCBBIA conference (Western Canada Bed & Breakfast Innkeepers Association - now known as the BC Bed & Breakfast Innkeepers Guild) held in Surrey, British Columbia. The seminar was a success and helped solidify his reputation in Canada as a leader in hospitality web site promotion. John was interviewed by PROFIT magazine regarding Google's new local search technology. FreshPromo expands to include an office in the United States, helping to better serve the needs of American clients. FreshPromo announces its partnership with the Social Planning Council of Ottawa in strengthening the web presence of its various initiatives such as Just Food and the CED Network of Ottawa, as well as working with Ottawa Tourism in its effort to promote local restaurateurs and food producers in the National Capital region. 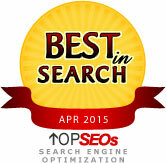 FreshPromo has been rated one of the Top Search Engine Optimization firms in Canada by the Independent Authority of Search Vendors, TopSEOs.com, for the months of May, 2009 currently through April, 2015. "new york city bed and breakfast"
So without further self-promotion, get in touch with our SEO team and find out how we can help your business achieve its online potential and exceed your expectations.